It is great to have pets at home but no matter how much you love your cat or dog, you can’t deny that it can be tough to get rid of all the hair they shed over your beloved sofa or across the carpets in your house. In a scenario like this, Shark’s HV390UKT DuoClean vacuum cleaner – with its motorised pet tool – may be the answer to all your cleaning woes. The vacuum comes with Shark’s DuoClean technology, coupled with Flexology technology, which makes the product easy to use. 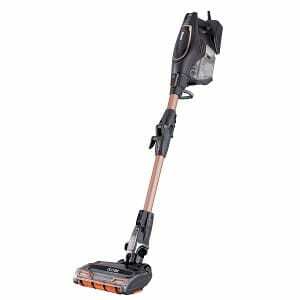 It can also be converted to a handheld vacuum, increasing its range of uses. Keep reading for more details on this vacuum cleaner! The Shark DuoClean Corded Stick Vacuum with Flexology (True Pet Model) is a relatively lightweight piece of equipment that has been designed keeping pet owners in mind. It is equipped with DuoClean Technology that allows you to switch between carpeted floors and hard floors without having to switch heads at each instance. The vacuum cleaner comes with two brush rolls attached to the vacuum head and is designed to draw out large and small debris from carpets as well as the finer, difficult to get dust from hard floors. Along with its prowess as a great floor cleaner, the corded vacuum also converts into a powerful and light handheld vacuum cleaner, making it easy for you to clean stairs, upholstery, ceilings and other hard-to-reach surfaces. It is tough to get all the hair that your dog or cat has shed all over your sofa but Shark makes it so much easier. It comes with a built-in motorised Pet Tool that helps pet owners remove embedded pet hair from different types of surfaces including floors and furnishings. 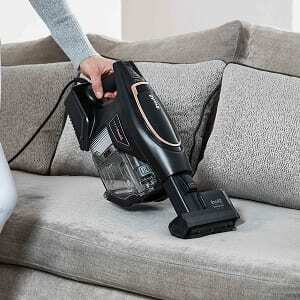 The main feature of this vacuum is Shark’s DuoClean floorhead. It comes with two motorised brush rolls that are very effective in removing large pieces of dirt along with small particles and dust from a number of different floor types. This means that you can now move from one room to the other without worrying about what type of floor you will have to deal with. No more switching heads all the time! The Shark DuoClean Corded Stick Vacuum’s True Pet Model comes equipped with the flexology technology that allows for the wand to bend without you making the effort. This makes cleaning under low-lying furniture much easier. The product comes with a lengthy 10m cord that allows you to reach considerable distances without losing out on power, and subsequently suction. No more worries about attaching and detaching the vacuum cleaner repeatedly. 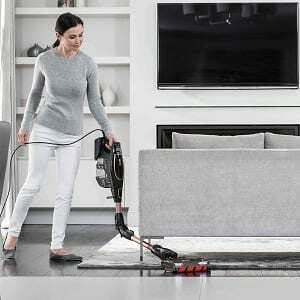 The corded vacuum can convert to a handheld vacuum quickly just by the touch of a button. The handheld mode comes with a Pet Tool that helps you remove pet hair from different types of floors and furnishings. Great for Hard Floors: You can turn the settings to ‘Hard Floor, Area Rugs’ to reduce the motor power for a more effective cleaning of such surfaces. The flocked roller installed in the cleaner is able to pick up dust and dirt with great efficiency, definitely better than a standard hard-bristle roller. Effective ‘Flexology’ Tube: When attached to the DuoClean head, the impressive Flexology folding tube lets it move around more easily, reaching places it wouldn’t be able to reach otherwise and also getting under low obstacles without you having to do extra work. Lengthy 10m Cable: As this is not a cordless vacuum cleaner, the long cable is a blessing. It helps you get to places you wouldn’t be able to reach especially when you’re away from the socket. Cheaper Than the Previous Model: The True Pet model brings together many of the features of the older Shark DuoClean Cordless Vacuum Cleaner with TruePet and Flexology IF250UKT at a price tag that is significantly lower than the previous model. Great for Pets: This is a specialised vacuum cleaner that is aimed at easily removing pet hair from sofas, carpets and stairs so that you have no reason to be mad at your furry buddy. Heavy and Tough on the Wrist: If you’re not a tall person, or well built, you may find the stick of the vacuum too long to use comfortably. All the weight has to be supported by your wrist, which can result in the process of cleaning becoming a cumbersome one. It can be used only for short periods of time if you have problems handling it for longer. DuoClean Head Can Be Unwieldy: It may be the vacuum’s USP but the DuoClean head is big and can be tough to handle. It tends to drive forward at times. Messy Bin and Filter Cleaning: If you have a pet that sheds a decent amount and you have a lot of cleaning to get done, the bin gets filled pretty fast and cleaning can be a bit of a task. Suction Could Be Better: The suction is not the best, especially considering that the product costs a decent amount of money. The True Pet model of the Shark DuoClean Corded Stick Vacuum Cleaner is a little bit on the expensive side, but in my view, it is an essential tool in the battle with pet hair. If you’re looking for something that will help you keep a pet-friendly house clean, this could be worth the money you spend on it. Its accessibility to difficult-to-reach corners, combined with Flexology and Duoclean technologies, make it a good buy.